What Is the Developers’ Mission? 1 What Is the Developers’ Mission? 3 How Does Odyssey Differ from Traditional Peer-to-Peer Sharing Services? 4 Who Is the Team Behind Odyssey? 5 Who Are Odyssey’s Partners? 6 How Does Odyssey Plan to Address Scalability Issues? The Odyssey project’s goals are rather lofty – the replacement of an economy based on private ownership. In Odyssey’s brave new world, everyone has something to contribute to the economy as a whole, and no one owns anything completely. This utopia can only come about, the developers argue, by a peer-to-peer sharing system that is open, secure, and able to communicate handily with a variety of other peer-to-peer offerings. Odyssey’s peer-to-peer sharing ecosystem relies on three main contributors – service providers, consumers, and reviewers. A single person may occupy all three roles simultaneously in different sharing systems, all linked by the Odyssey backbone. Service providers will use tokenized assets on the blockchain to offer their services for sharing, the same way Uber offers rides or Airbnb offers beds. Consumers likewise can make use of the shared services offered by the service providers, while reviewers act as a sort of quality control via the blockchain. All information contained on the blockchain is secure and transparent due to the blockchain’s cryptographic nature. Information on the blockchain is also inherently distributed, allowing all levels access to previously proprietary information. 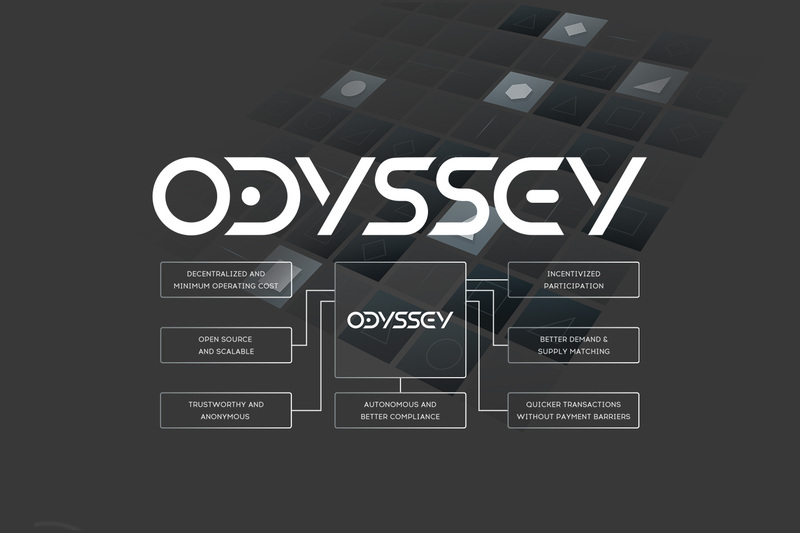 Odyssey’s rating system is also unique, using its OCN coin as both fuel and incentive for the blockchain’s continued development. This is in opposition to more traditional sharing models, which rely on third-party reviews to rate service providers’ quality. How Does Odyssey Differ from Traditional Peer-to-Peer Sharing Services? Odyssey’s main complaint regarding the traditional peer-to-peer service model is its segmented nature. Rides can only be shared on ride-sharing systems, beds on bed-sharing systems, and so forth. 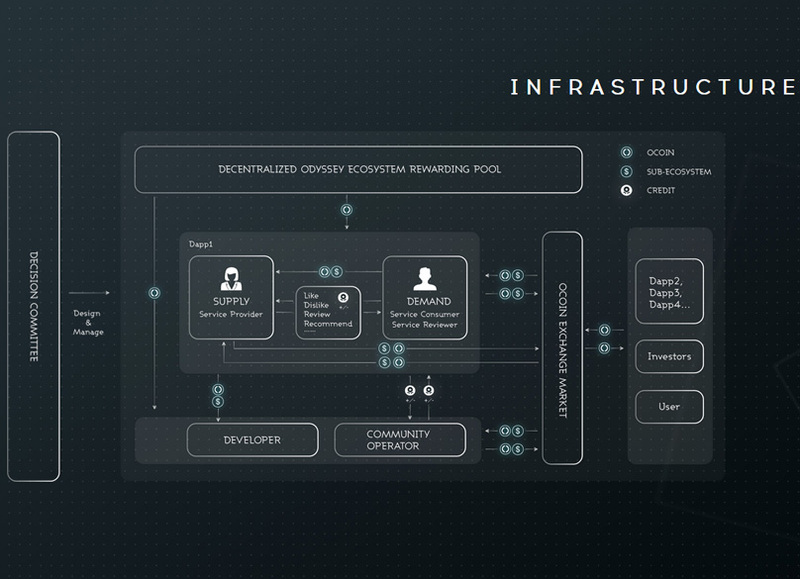 Odyssey aims to unite these systems into one cohesive ecosystem, linking service providers, customers, and reviewers in a peer-to-peer sharing web. 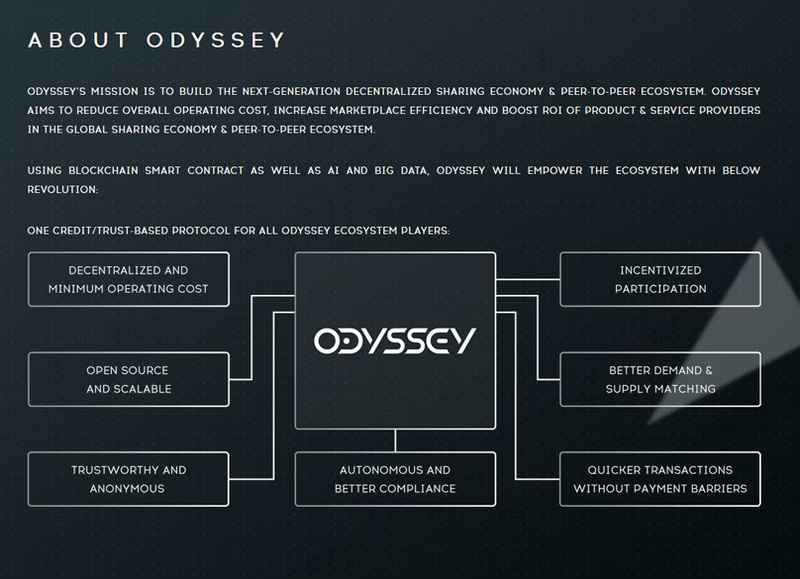 Odyssey’s ultimate vision is an economy that is almost completely decentralized. This hypothetical economy focuses more on the individual and that individual’s ability to contribute across multiple sharing platforms. In short, Odyssey plans to do away with the millennia-old company model. A group will no longer have to unite to provide a good or service, if that good or service can be provided by individuals strung along the blockchain. Odyssey also strives to break sharing monopolies, which run counter to the spirit of the endeavor. By unlocking the potential of all individuals to participate in a sharing economy, Odyssey hopes to simultaneously empower the masses while making all services both cheaper and more freely available. Who Is the Team Behind Odyssey? Odyssey lists its two primary advisors as Yi Shi and Justin Sun. Yi Shi is the CEO of Shanghai’s Avazu Holding, while Justin Sun is the driving force behind Tron coin. The advisory team also includes Goh Jian Kai, founder and CEO of RateX, a Southeast Asian cross-border payment solutions system. Odyssey’s business model relies heavily upon partners to further develop a multifaceted sharing ecosystem. As of May 2018, Odyssey has developed partnerships with several big names, including IBM and the Amazon Web Partners. Two of the earliest partnerships were OBike and Tron. OBike is a stationless bicycle sharing company in Southeast Asia, and Tron is a cryptocurrency that intends to leapfrog competitors, like Ethereum, to create a sort of Web 4.0 based on decentralized content creation and distribution. 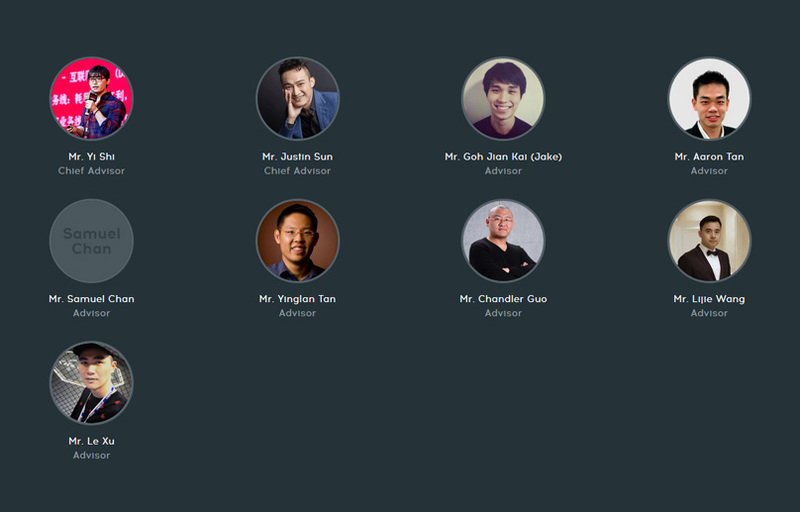 Tron lead Justin Sun is one of the primary advisors for Odyssey. How Does Odyssey Plan to Address Scalability Issues? Odyssey’s dreams are big, and that will eventually require a massive network of service providers, customers, and reviewers. Odyssey plans to implement a temporary system of recording at least some transactions offline to be entered into the blockchain at a later time. However, Odyssey also plans to heavily base future improvements to developments within the Ethereum blockchain. As that blockchain solves its scalability issues, those solutions will be applied to Odyssey. Visit the Odyssey project’s homepage here and check out its white paper here.